Allergies occur when your body's defence system (immune system) overreacts to certain substances. The immune system treats a harmless substance as if it is a harmful germ or virus. Many things can cause this overreaction, including pollens, medicine, food, dust, animal dander, and mould. Managing your allergies is an important part of staying healthy. Your doctor may suggest that you have allergy testing to help find out what is causing your allergies. When you know what things trigger your symptoms, you can avoid them. This can prevent allergy symptoms, asthma, and other health problems. If you have been told by your doctor that dust or dust mites are causing your allergy, decrease the dust around your bed. If you are allergic to pollen, stay inside when pollen counts are high. Use a vacuum cleaner with a HEPA filter or a double-thickness filter at least 2 times each week. 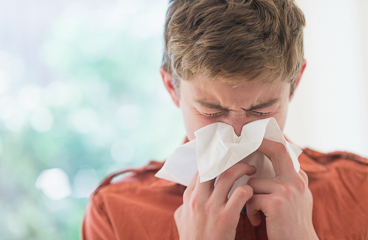 Enter C764 in the search box to learn more about "Allergies in Teens: Care Instructions".